When you need a cookie, you need a cookie. 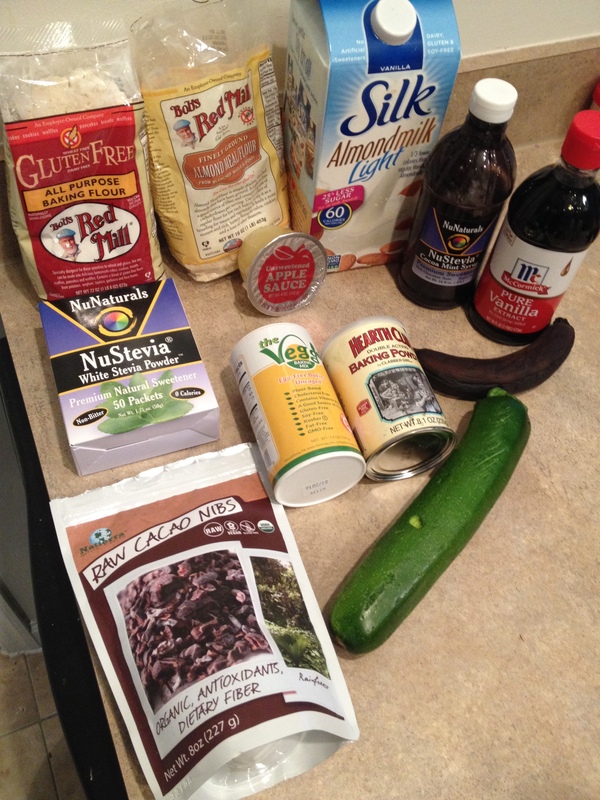 And when you want zucchini bread, you make a cookie … right? I mean I have done a zucchini bread and a zucchini bar before, so I decided to do a cookie but add a twist. Maybe add a flavor that you wouldn’t expect. Like sugar-free vegan cocoa mint sauce. Zucchini and mint? Well, you just try it and see. It’s good! 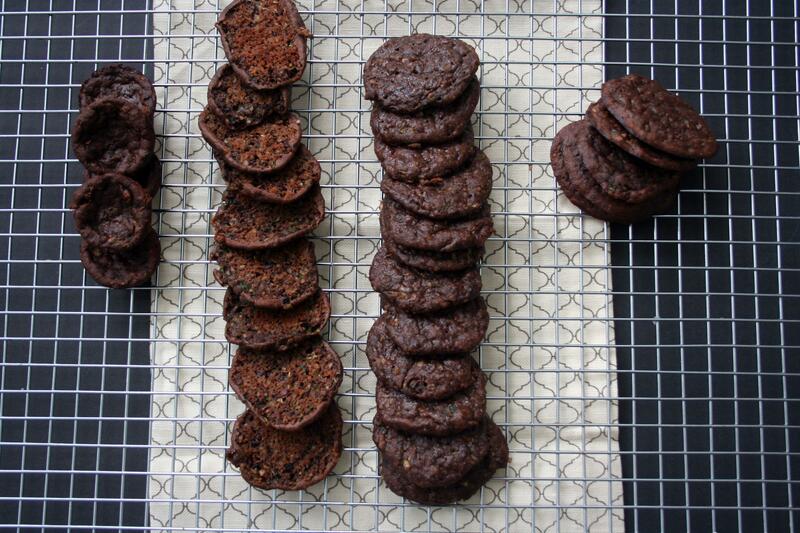 Here are some originally flavored, and a little addicting, vegan and gluten-free Chocolate Mint Zucchini Cookies. I won the cocoa mint sauce from NuNaturals from a giveaway. I love giveaways and will enter almost any I come across. I love winning. Especially food. I love the mint sauce, it is so strongly flavored that when I make my coffee frap’s at home I never have to add much because the flavor really comes through. I decided that I wanted to try it with something in a cookie – but it’s hard to think about what to add with mint. I mean all I can think of when I think of mint sweets is the Girl Scout cookies. 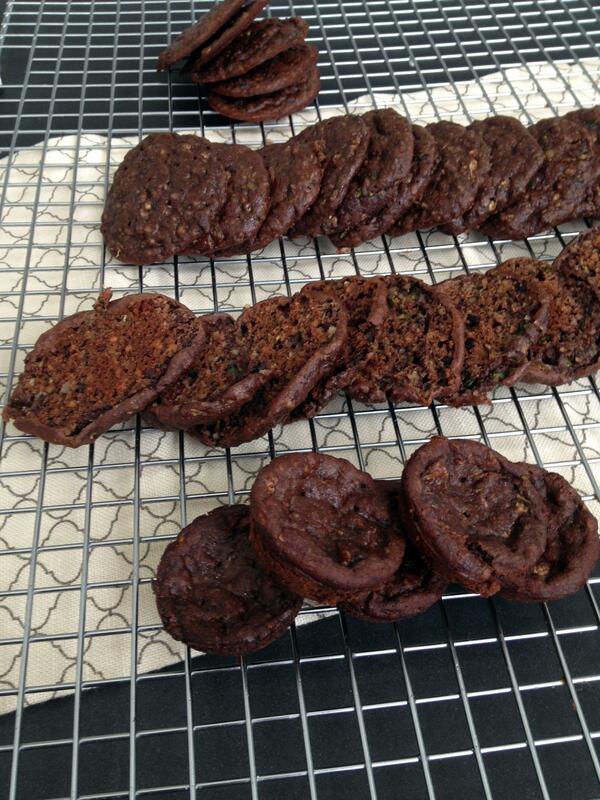 So I decided why not add some green to these cookies with zucchini. But my baking doesn’t always turn out as I plan. Best of intentions and all. But when baking tries to turn into a fail, just make some changes and it will all turn out. Mine tried to make my cookies into fails. The problem was the parchment paper. Do Not use it! My first batch with the paper I had to scrape the cookies off the paper which was no biggie, they came off and still tasted good. A little soft but no big deal. 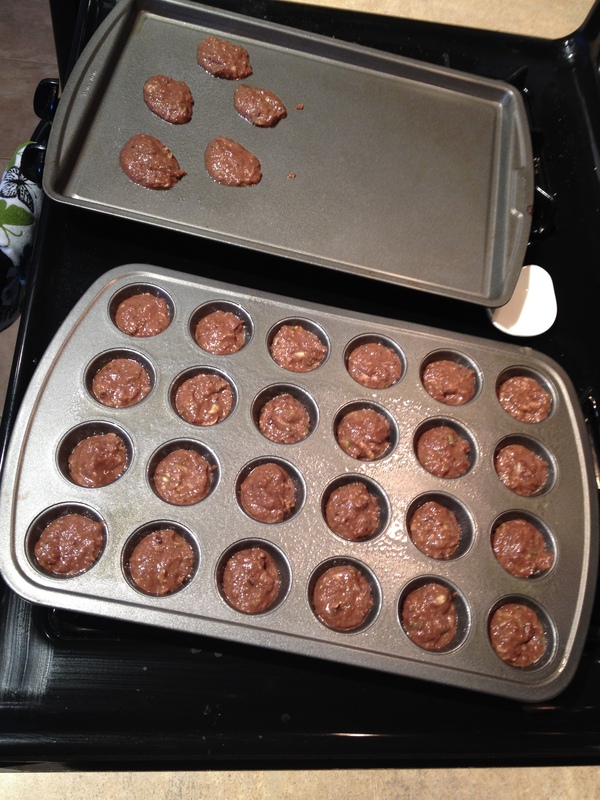 I thought, though, that the batter was wrong so I put the batter into mini muffin tins and also made a few cookies without the parch paper. 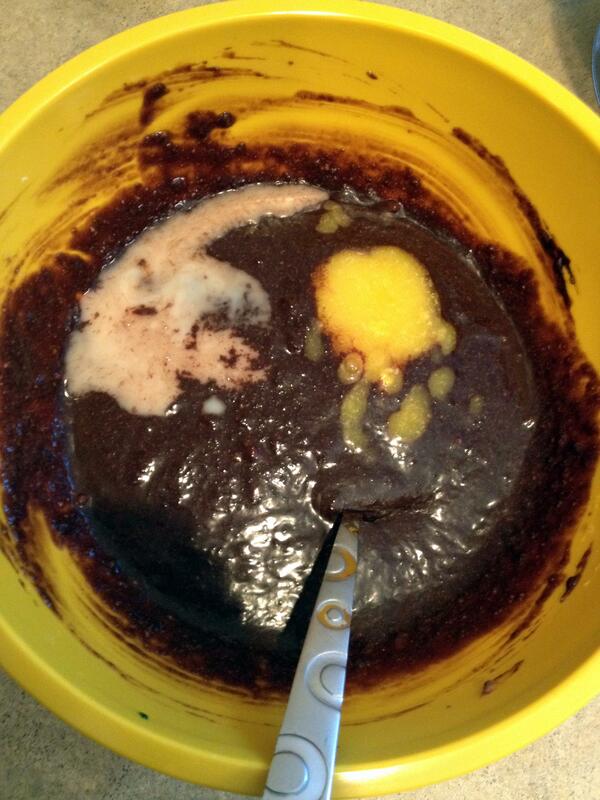 Well, this batter didn’t do so well with the tins – it took 26 minutes! to finish baking -, but did with no paper. So no paper it is. Soft and chewy cookies – and also soft and chewy mini-muffins, so you can try the tins, but just know it will take forever to bake. But I prevailed and yum minty cookies! Start by shredding the zucchini in your food processor then scraping it all into a bowl. Take out the shredder attachment and add in the other mixer thing and add back in the zucchini shreds and just process the shreds into smaller pieces. You don’t want to have long pieces just hanging out. 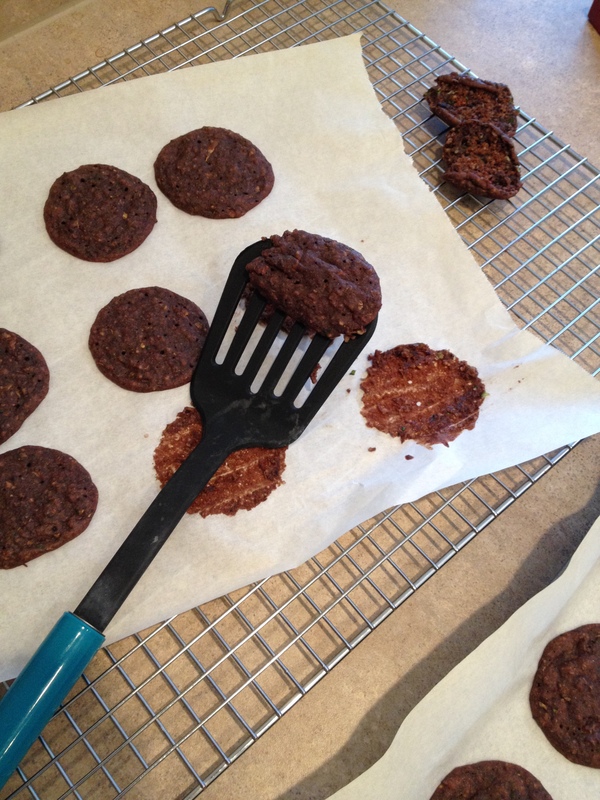 Then in a smaller food process or blender process the cacoa nibs into small pieces for a little crunch in the cookies. In a small bowl mix flours and baking powder. 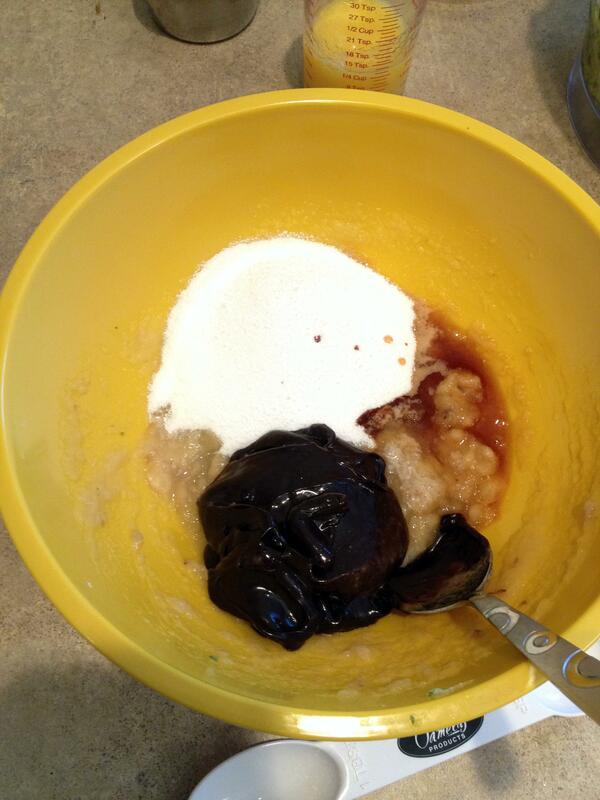 Using the same bowl the zucchini was in, add the banana and applesauce and mash together. Pour in NuStevia, mint sauce, and vanilla and mix. Mix The Vegg then pour into the wet mixture and add almond milk and mix again. 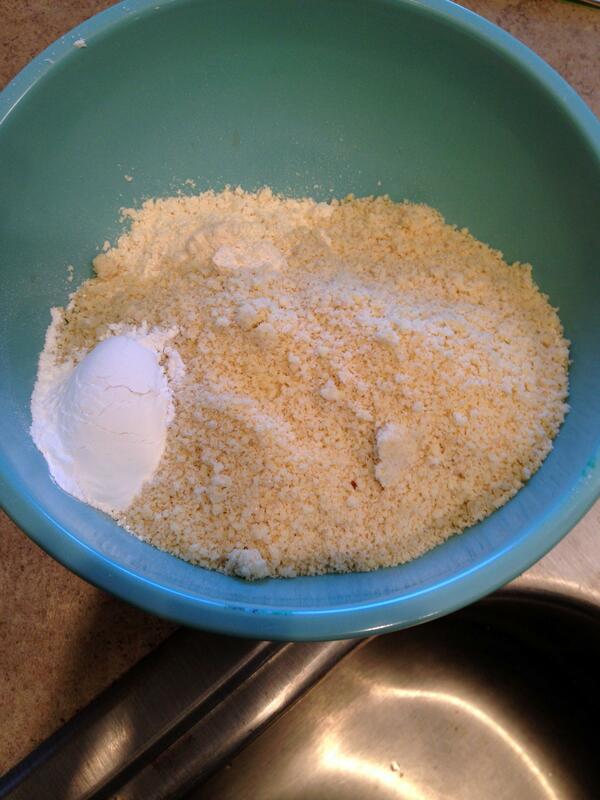 Mix flour into wet ingredients until just combined. Fold in zucchini and nibs. 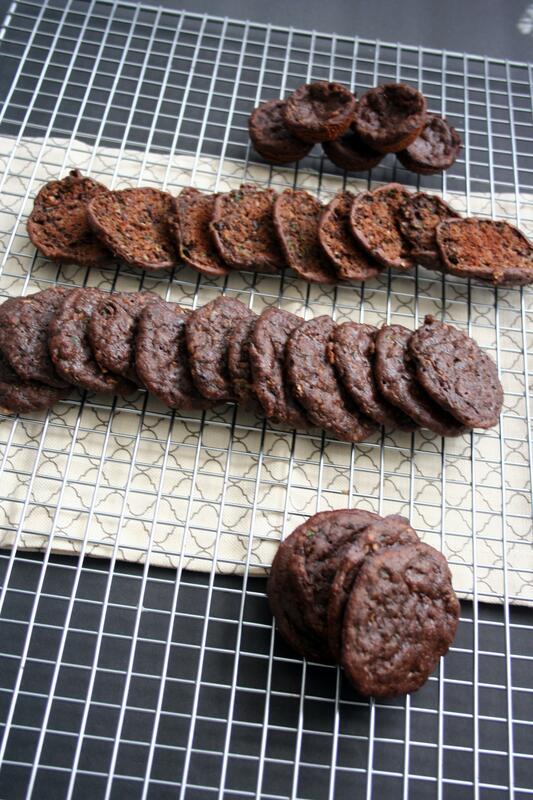 Use a small spoon to portion out cookies and bake at 375 degrees for about 12 minutes. Enjoy! 2. In food processor shred washed zucchini. 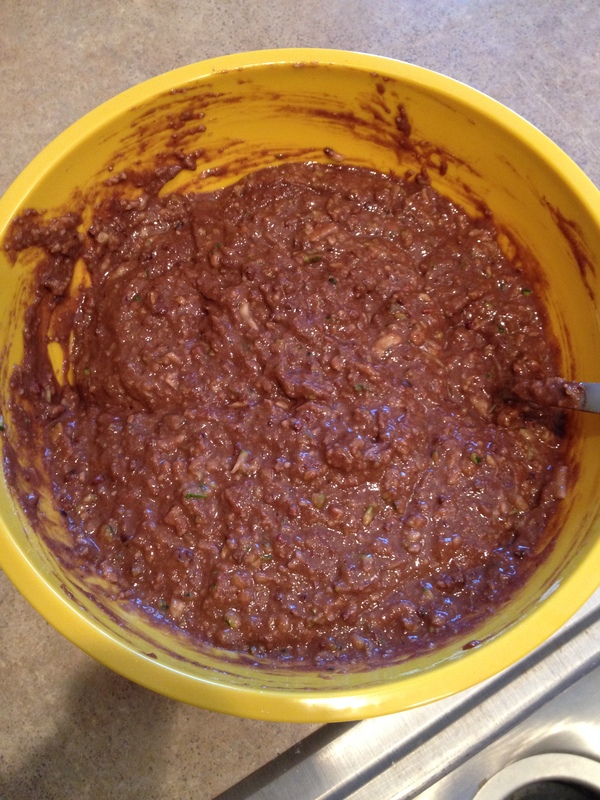 Scrape out zucchini into a large bowl then put in the mixer attachment and add back in the zucchini shreds. Process until pieces are cut smaller. 3. 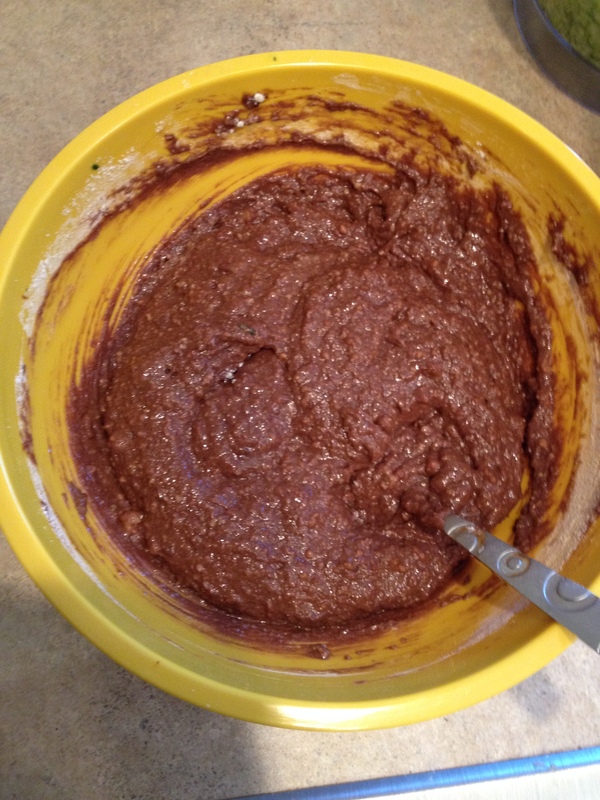 In blender or small food processor grind cacao nibs into small pieces. 4. In small bowl mix flours and baking soda. 5. In the same bowl as the zucchini was in mash banana with applesauce. Add in NuStevia, mint syrup, and vanilla and mix. 6. Mix together Vegg and add to bowl with almond milk. 7. Pour in flour and mix until just combined. 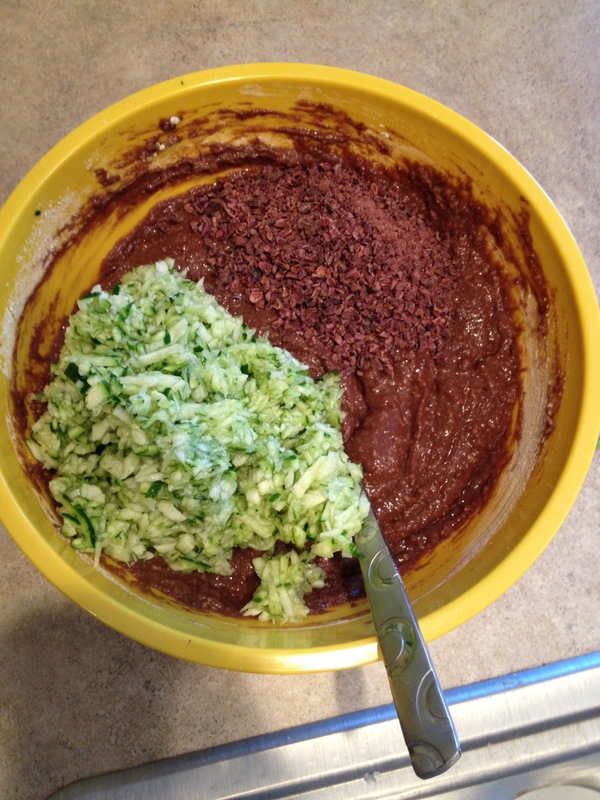 Fold in zucchini and nibs. 8. Using a small spoon portion out cookies. This looks like a very nice combination! I’m sure the cookies are moist and delicious. Thanks! 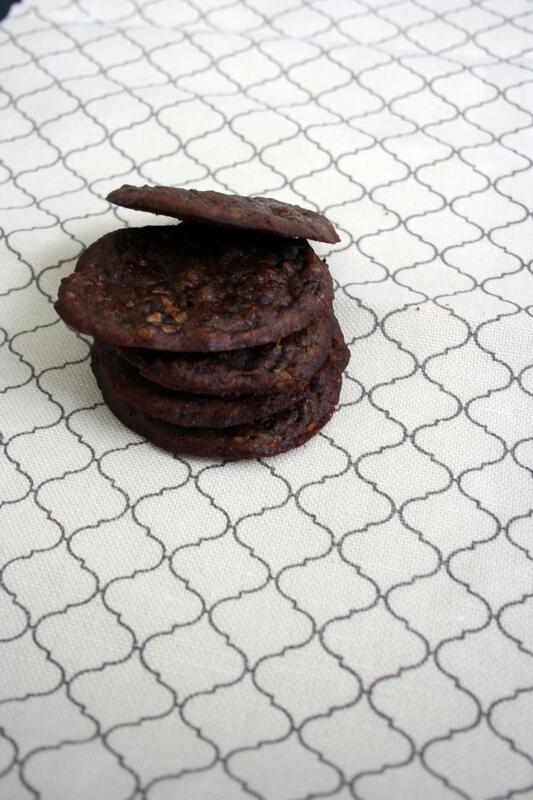 They were so good – always nice to have a semi-guilt-free cookie! Oh yum! Good thing I didn’t have any ice cream or I would have been making sandwiches with them all!